Also known as a Cape Cod or Nantucket chair. Western red cedar has magical properties. It is lightweight and has an incredible thermal co-efficient, which means even on hot days, it is cool to sit in. 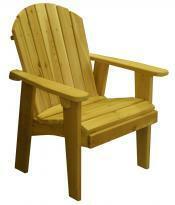 Overall depth: 36"; overall width: 27.5"; overall height: 38"; seat depth: 19"; seat width: 20". Shown here with optional footrest. Save money and buy a set with table! Click here. CLICK TO SEE ENTIRE CHAIR COLLECTION. Also available in Big Boy and loveseat sizes. CLICK TO SEE ENTIRE COLLECTION OF ROCKERS AND GLIDERS. 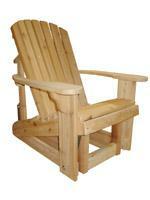 The Adirondack Loveseat is one of our most popular pieces and comfortably seats two. 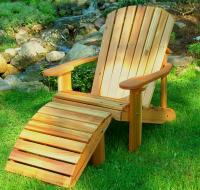 A loveseat, two Classic Adirondacks, two footrests��and our Garden Table is customers' most popular set choice. CLICK TO SEE OUR ENTIRE COLLECTION OF LOVESEATS AND SOFAS. 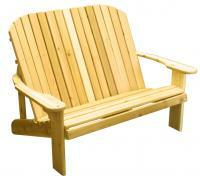 A more traditional piece, this is the ideal addition to any backyard. Many customers purchase four Garden Chairs with our Garden Table! SAVE WHEN YOU PURCHASE THE SET SHOWN HERE.